That gift? EA's From Russia with Love for the Nintendo GameCube. I've been dying to play this game ever since I learned Sean Connery would be voicing the character of 007, James Bond, and that the game would be set in the 1960s, just like the movie (which happens to be one of my all-time favorite Bond movies.) I love this era - musically, technologically, cinematically, you name it, so I had great anticipation. Well, after about 90 minutes of play-time, I must say that I'm not disappointed. The game commences with that famous James Bond theme song and gun barrel imagery (and it's the one of Connery wearing the hat, from the early days of the franchise...). The game then moves into a splendid and spectacular "pre-title" sequences like those we've grown accustomed to in the series. A group of soldiers attempt to kidnap the Prime Minister's daughter at a cocktail party, in London, but Bond is there (in white dinner jacket, naturally) and takes 'em on. From there, we're into high-action mode as Bond heads to the roof (through many machine-gun armed soldiers) and must use a rocket-pack (like the one seen in Thunderball) to take to the sky. When the PM's daughter is forced aboard a helicopter, Bond must wage aerial combat (around Big Ben...) with the larger craft, to rescue her. All I can say is...this sequence rocks. After the opening theme song (From Russia with Love...) and Bond-ish title-credits and visuals (including some attractive ladies...), the game proper begins. There's a set-piece at the hedgemaze of SPECTRE headquarters, where an ex-KGB officer recruits assassin Red Grant (Robert Shaw in the movie) to orchestrate a humiliating death for Mr. 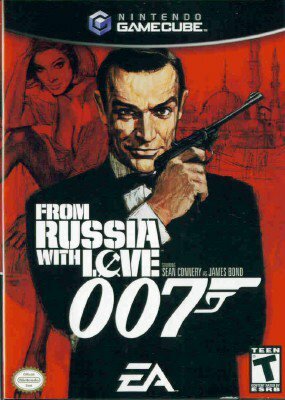 Bond, not to mention heat up the Cold War between the West and the East. From there, it's off to the headquarters of M16, where Bond flirts with Moneypenny and receives a briefing from M about his mission (which is the same as the movie: retrieve the Russian decoder, known as a LEKTOR). After the usual pleasantries, Bond heads down to Q-branch to get some gadgets (including a laser equipped watch and a remote-controlled flying device called a Q-copter...) and additional training. It's at that point that comes one of the coolest early sequences so far. Bond arrives in Turkey and drives his specially equipped Aston Martin (from Goldfinger) to a spy station. Of course, he meets some bad guys on the road...and finds use for machine guns, tire wreckers and other devices. That's about as far as I got before the evening ended and we had to race to the TV to watch Surface, Prison Break and Medium (whew!) But anyway, this game is really ultra-cool. It has a wicked sense of humor (two technicians at MI6 joke about a day when everybody will have computers on desktops...), is faithful (mostly...) to the plot of the movie (so far...) and is beautifully designed to evoke the world of the mid-1960s. And of course, you have Connery's voice leading you on, which is cool beyond measure.